As we approach the first anniversary of The Mark Steyn Club, we'll be presenting some musical celebrations as part of the festivities, so do keep an eye on our home page as the days go by. I've always thought of our Song of the Week as perhaps our least controversial department, if only by comparison with all the war and politics and whatnot all over the rest of the site. So I was interested to discover our musical offerings are as toxic as everything else around here. Late on Friday, having brought a ten-million dollar suit against me and lost comprehensively, CRTV and its billionaire owner Cary Katz decided to re-sue me, this time for a mere five million dollars. Pages 68-76 of their 200-page complaint are a printout of Song of the Week #325 "We are the Champions" and pages 77-85 are a printout of Song of the Week #320 "Oh Happy Day", both of which exhibits Mr Katz claims are disparaging and defamatory of him. Neither mentions him or CRTV, and our legal team is mystified as to why even CRTV would lay these harmless essays before a judge. But we thought we might ask SteynOnline readers for their insights. So, if you can identify anything in my essay "Oh Happy Day" that is actionable, let us know by emailing here, and we'll pick a winner and buy him or her a year's subscription to CRTV. They're apparently rather short of subscribers, and now that Katz has sued his own company into insolvency we need to help bulk up their cash-flow so they can afford to pay us the damages Judge Bransten and Judge Gordon have ordered. Second prize is two subscriptions to CRTV, but you undoubtedly saw that joke coming. We're very fond of our little theme tune, so we're delighted, as we approach the first birthday of The Mark Steyn Club, to celebrate the 75th anniversary of "I've Heard That Song Before" reaching Number One on the Billboard pop chart. It wasn't merely at the top for this particular week in 1943; it was Number One for the entirety of March, the entirety of April, and the entirety of May - and then, after being briefly supplanted by "That Old Black Magic" for a solitary se'nnight, it returned to the top for a last hurrah in June. It comes from a movie of the previous year called Youth on Parade. Oh, come on, Youth on Parade: You must have seen it. Yes, that Youth on Parade, the one about a bunch of college coeds who create a fictitious fellow pupil as the "perfect student" and then find - thanks to various plot twists and threats of expulsion - that they're required to produce her for real in front of their professor. 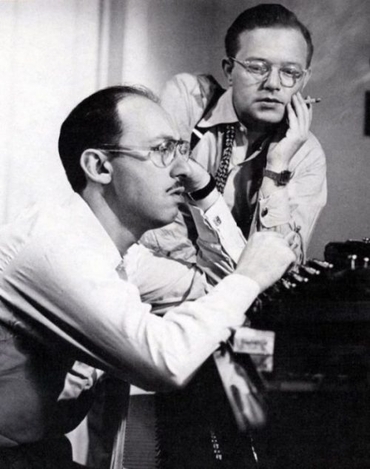 And, insofar as the picture has any claim to fame, it's that it marks the start of what would prove a powerhouse songwriting partnership between composer Jule Styne and lyricist Sammy Cahn. In the years that followed Styne & Cahn would provide their pal Frank Sinatra with one of his loveliest ballads, "Time After Time", and another that comes pretty close, "Guess I'll Hang My Tears Out to Dry", and write one of the world's most performed Christmas songs, "Let It Snow! Let It Snow! Let It Snow!" And you've certainly heard those songs before. The first time I met Jule Styne was at his office up the dingy stage-door stairs above the Mark Hellinger Theatre on Broadway. I noticed he wore a gold identity bracelet, and he showed me the inscription on the inside: "To Jule, who knew me when, Frankie" - a gift from Sinatra delivered to a bleary Styne by a courier from Cartier's the morning after the singer's spectacular solo debut at the Paramount Theatre in 1942. He wore it for the next half-century. I remember it shaking when he waved his arms around and yelled, to make some point or other. He was a great yeller. He yelled at Jerome Robbins and Ethel Merman on Gypsy, he yelled at Streisand at Funny Girl. He yelled at Sinatra, which would cause occasional half-decade ruptures in their relationship. And, even when he wasn't yelling, his mind tumbled along faster than the words could keep up, so that his speech often omitted key verbs and nouns. His lyricists on "The Party's Over" and "Make Someone Happy", Betty Comden and Adolph Green, considered it a language all its own: Stynese. I had a radio producer who hated it whenever I brought him an interview with Jule Styne. Most radio editing involves removing extraneous words. With a Styne tape, half the essential words came pre-removed, as an ever more emphatic composer galloped on to his next big point before concluding triumphantly (as he once did to me after a complicated effusion on arrangers): "So them becoming that didn't become that!" Styne never wasted his time with false modesty - in the Seventies, he announced he was America's greatest living composer - but his ego was so lightly worn it was rather endearing. Besides, people who need people are the luckiest people in the world, and Styne never forgot which people composers need. "I've been very fortunate in having my songs sung by the greatest male singer and the greatest female singer," he said, referring to his former flatmate (Sinatra) and a funny girl he helped make a star (Streisand). And as he liked to emphasize: "Without the rendition there is no song." He never set out to write music. He was a Londoner, a poor boy born Julius Stein, though he seems never to have been called anything but "Julie". He was a child impressionist on the London stage before the First World War. At the Hippodrome, he got to do his Harry Lauder routine before Sir Harry himself. After sitting through young Julie's rendition of "She's My Daisy" and "Roamin' in the Gloamin'", the great Scot gave him some advice: "When you do impressions, you're never anyone in your own right. Do something of your own. Learn the piano or something." By the time the family moved to Chicago, the impressionist had become a pianist. By the age of nine, he'd played with the Chicago and Detroit Symphonies. At thirteen, he won a scholarship to the Chicago School of Music. How do you get to Carnegie Hall? Practice. He practiced, certainly, but he liked the energy and hustle of burlesque and speakeasies. As a teenager, he played in concert halls and whorehouses. But he gravitated naturally toward showbiz: the hip-hooray and ballyhoo was his milieu. In 1925, he was nineteen years old and down in Florida, touring with Arnold Johnson's band as a pianist-arranger. One day he's strolling along the beach with a cute girl, and he starts humming. "What is that?" she says. "Gee, I'll bet you made that up." So he hums a few bars more. And she says, "I'll give you a date tomorrow night if you play that song for me in the club tonight." It was his first hit, and he liked it so much he wrote virtually nothing else for the next fifteen years. "I thought songwriting was square, so to speak," he said to me. Instead, he became a vocal coach, which gave him a keen insight into singers ("Frank sings the words," he said. "The other fellers sing the notes"). He wound up in Hollywood, at Republic Pictures, which specialized in westerns. "I did everything," Styne said. "I coached Gene Autry, I coached his horse, I washed his horse... The horse got more respect than I did. The stable was better than my office." One day at Republic, he worked with an ambitious young lyricist on loan from Paramount: Frank Loesser. It was 1941 and Loesser had already written big hit songs like "Heart and Soul" and "Two Sleepy People", and he didn't want to be working on some lousy B-picture at Republic with some horse-opera tunesmith no one had heard of. So after badmouthing Styne and the studio for twenty minutes he turned to the composer and demanded: "Okay, what you got?" Sammy Cahn, on the other hand, was a New Yorker, younger than Jule, and a kid in a hurry. He'd worked as a freight-elevator operator and a movie usher and played the violin in a theatre pit. Then he'd gotten a job writing special material for the great Jimmie Lunceford band, and after that formed a songwriting team with Saul Chaplin. But Cahn & Chaplin had split up, and in 1941 Sammy was on his uppers. He was in Hollywood, but out of work, and padding the streets with nothing to do. One day he got a call out of the blue from Cy Feuer (later the producer of Guys & Dolls, but then a studio chief at Republic) asking if he'd like to do a picture with Jule Styne. Cahn had never heard of Styne, but he was in no position to be picky. "Right now I'd do a picture with Hitler," said Sammy. Unlike MGM, Warners or Paramount, in 1941 Republic wasn't exactly known for its music. But Sammy was introduced to Jule and, as Loesser had done, as all lyricists do, he asked him what he'd got. Styne sat down and played a tune from start to finish. "Play it again," said Cahn. "Slower." So Styne did. "Slower." So Styne played it even slower. And Cahn said, "I've heard that song before." "What are you, a tune detective?" said Styne, resenting the accusation of plagiarism. He knew those Styne downbeats were as important to the song as any of his words. Republic pronounced themselves satisfied with the number and gave it to Bing's brother Bob Crosby and his band for Youth on Parade. And that was that. Jule Styne hadn't terribly cared for Sammy Cahn. He was looking for something classier in a lyricist, and he found Sammy a bit uncouth, too much the pushy New York wise-guy on the make. Which always amused me: Most writing teams bicker and squabble because they're temperamental opposites (Gilbert & Sullivan, Rodgers & Hart, Cy Coleman & Carolyn Leigh), but Styne and Cahn were in a certain sense too similar. There are songwriters who come from the Lower East Side and fit right in swanning about with Cole Porter and Lady Mountbatten. But there are others who never quite smooth off the rougher edges. Styne was a diminutive ball of energy, and Cahn looked like the shnook accountant, and Hollywood encouraged their worst inclinations. Styne was briefly Sinatra's flatmate, and Sammy ran with Frank to the end of his days: as Sinatra did, Styne liked to gamble, although generally disastrously; like Sinatra, Cahn was wont to womanize, although I never found accounts of his Frank-scale conquests entirely persuasive. But in 1942 Jule was seeking a poet, a man of letters, urbane and upscale - and Sammy reminded him too much of where he'd come from. So he moved on to other lyricists, such as Kim Gannon. One day, back padding the streets, Cahn bumped into Gannon, who asked: "How did you like working with Jule Styne?" "I liked it fine," said Sammy. "Did you write a song about a song with Styne?" "Yeah," replied Cahn, "I wrote a song about a song, and I think it's one of the best lyrics I've ever written." "Maybe you think it's the best lyric," said Gannon. "Styne thinks it's the worst lyric he ever heard." There would be other "worst lyrics he ever heard" in the decades ahead: It was something of a competitive category with Jule. But right now it was Sammy's that held the title. And that's where things would have stayed were it not for the intercession of Big Sam Weiss, a musician turned song-plugger, and allegedly, on the night Sinatra slugged columnist Lee Mortimer, the guy who held the newspaperman down so Frankie could land one on him. Big Sam led a hectic life, but he'd heard "I've Heard That Song Before" and he loved it. And he managed to get it to the bandleader Harry James. There was just one problem. At the stroke of midnight on July 31st 1942 the American Federation of Musicians was supposed to begin a strike against the recording companies over a royalty dispute. The James band went into the studio on that very last day, and "I've Heard That Song Before" was the very last number to be professionally recorded before the musicians' union shut down the pop biz. Henceforth all songs would be songs you'd heard before because there would be nothing new for two years - the longest ever strike in the entertainment business. Everyone knew it well in the spring of 1943. It was Number One for thirteen weeks - an all-time record that held for over half a century until 1995, when Mariah Carey and Boyz II Men pipped Helen and Harry by three weeks. "Sammy loved that big band sound," Jule said to me, "and that's all he wanted to write." But sometimes it all comes together, and that song is one of a dozen or so that sum up the era. It also reconciled Jule Styne to the lyric. He heard Harry James on the radio, and picked up the phone. "Hey, Sammy, I think we ought to write some more songs." And a great songwriting team was on its way. ~You can hear "I've Heard That Song Before" in Mark's centenary salute to Sammy Cahn. The above essay contains material from Mark Steyn's American Songbook, which features the stories behind many other songs by Jule Styne and Sammy Cahn. Personally autographed copies of the book are exclusively available from the SteynOnline bookstore - and, if you're a Mark Steyn Club member, don't forget to enter the promo code at checkout to enjoy special Steyn Club member pricing. As we always say, club membership isn't for everybody, but it helps keep all our content out there for everybody, in print, audio, video, on everything from civilizational collapse to our Sunday song selections. And we're proud to say that this site now offers more free content than ever before in our fifteen-year history. The offensive words to CRTV happen in the very text of "we are the Champions" ..."the judges will decide..the like of us abide". Mark what you are suggesting by choosing that song is that Katz, and his half a brain cell, are lesser than you. You were "in an oddly triumphant mood' for a reason. It can be inferred that because of CRTV's decision to fire you, "The likes of us" in your interpretation, is referring to CRTV. An obviously defamatory remark because the phrase "thee like of us/you" imply that the you or the us is a lesser being. Just because Katz has half a brain cell does not mean he is lesser. ALL humans are equal! Katz has gone completely unhinged if he thinks either of those columns were about him. I mean, really. That's not a serious suit; it can't be. It's pure malarkey. Whoever is purporting to represent him ought to slink off with his tail between his legs. I regret that it's come to this, but: could you please post the 200-page complaint, if you are not prevented from doing so? We're trying to figure out a way to do that, Xavier, but it's a super-large file. Maybe we'll run it piecemeal, as a nightly serial, like Tales for Our Time. Setting aside the possibility Katz is simply a paranoiac, it may be that he or his lawyers infer you were celebrating Katz's loss in arbitration - though how that could be considered disparaging or defamatory is beyond my imagination. Or it could be that Katz is desperate & clutching at whatever thin reeds he can find. The Helen Forrest-Harry James rendition is on a two-set CD collection of Big Band Swing Era tunes that I listen to on long drives. Many of the 48 songs on the two CD's have, I'm sure, made the Steyn Song of the Week lineup. I suppose I could nose around the website and find the complete list - I'd be curious if Mark has ever taken a swing at Beat Me, Daddy, Eight to the Bar or Cow-Cow Boogie. Let me join the chorus of Steyn Club members who have congratulated Mark on his victory in the first Katz/CRTV suit and to express my anger, regret and - sadly - lack of surprise at the opening of round two. The weaponizing of the judicial system is one of the many signs of the collapse of the moral, legal and constitutional principles in this nation. How sad that a man who writes for a living needs a legal team. We're with you on the counter-suit. Well, if he wants Obamacare repealed so he can get his student-loan business back, a good way of doing everything he can to prevent that outcome is keeping this going. You may remember Trump decided to run for president after being humiliated by Obama at the White House Correspondants Dinner. So can we look forward to Sarah Huckabee Saunders deciding to run for president? Your first paragraph here was a real mind blower and especially jarring to read under a Song of the Week heading. Lawsuits are nightmares, like being stuck on a screamer roller coaster ride that never ends. Insane, frivolous and punishing are three words that spring to mind. Thoroughly enjoyed your cool and clever rendition of "I've Heard That Song Before" in the first half of the audio recording of your centenary salute to Sammy Cahn from "Ain't That a Kick-Sammy Cahn all the Way" piece on January 3rd, 2015. The entire audio was terrifically entertaining and informative. How do you do it all? Well I live in Australia and I realise it's a different jurisdiction, and look I'm no barrister ( but I can make a mean latte), but is it possible to simply walk into the court and say to his legal team "Felix Ungarie"? Will they get that or is it defamatory? I checked out two versions of this song on YouTube: (1) Harry James and Helen Forrest, and (2) Frank Sinatra. The former is 2:56 in duration, but contains only 61 seconds of music/lyrics, which kick in at 1:12 and out at 2:13. The rest is all music. The Sinatra version is 2:32, and contains more lyrics time, but only due to repeats. Personally, I prefer the James/Forrest version. I guess it can be called a song about a song, but it's really a well-performed, super upbeat song about a good memory, or good memories. No wonder it was a winner. On an unrelated song topic, ABBA has a new song and is planning a virtual tour with holograms representing the group. I recall your "Waterloo" song of the week from last year so I wonder if ABBA's new offering is on your radar and what you think of the hologram tour. I wonder, will they be holograms of their 1970's selves or their current selves? I'm betting 1970's. Mark: As a wordsmith you would be a wonderful lyricist. The latest of many examples, "..the hip-hooray and ballyhoo was his milieu." I can't claim credit for four-sevenths of that, Fred: "the hip-hooray and ballyhoo" is a line from "Lullaby of Broadway" by the great Al Dubin. But you added lyrically, "..was his milieu" which made it better.